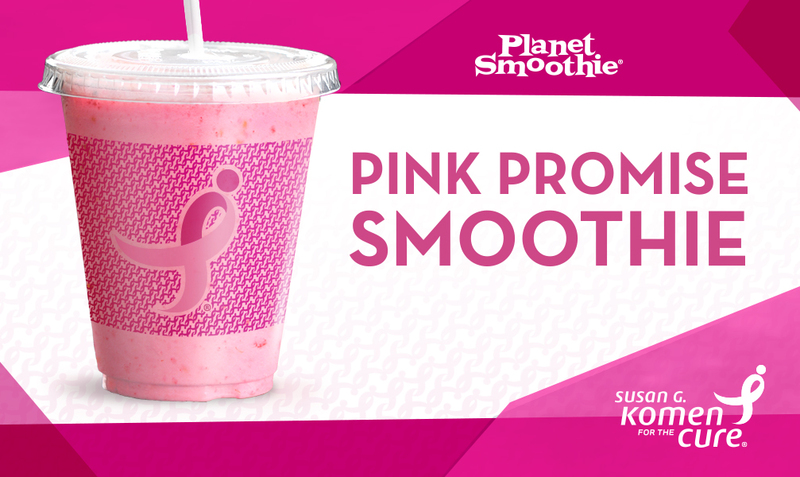 Planet Smoothie, in partnership with Susan G. Komen, developed a “Pink Promise” smoothie made with cancer fighting anti-oxidant ingredients to raise money for breast cancer awareness. The partnership and the creation of the “Pink Promise” smoothie were an excellent match with Planet Smoothie’s key female demographic and healthy lifestyle brand attributes. Create a $100,000 fundraising campaign that incorporated the brand standards of both Planet Smoothie and Susan G. Komen. Fridge created a campaign to promote the “Pink Promise” smoothie that included in-store POP, a special clear cup that displayed the bright pink product, local store marketing (LSM), a t-shirt (for employees and retail sales), store window decals and print ads. A partnership with country music artist Candy Coburn was facilitated to incorporate her song “Pink Warrior,” written in memory of Coburn’s grandmother, into the campaign to increase awareness. Downloads of the song were available on the campaign microsite Fridge developed. The microsite was also used to sell t-shirts, accept direct donations to Susan G. Komen and promote the cancer-fighting benefits of the "Pink Promise" smoothie. With the help of Fridge, the Planet Smoothie and Susan G. Komen partnership achieved its $100,000 goal through sales of the "Pink Promise" smoothie and merchandise, as well as downloads of Coburn’s song and direct donations.